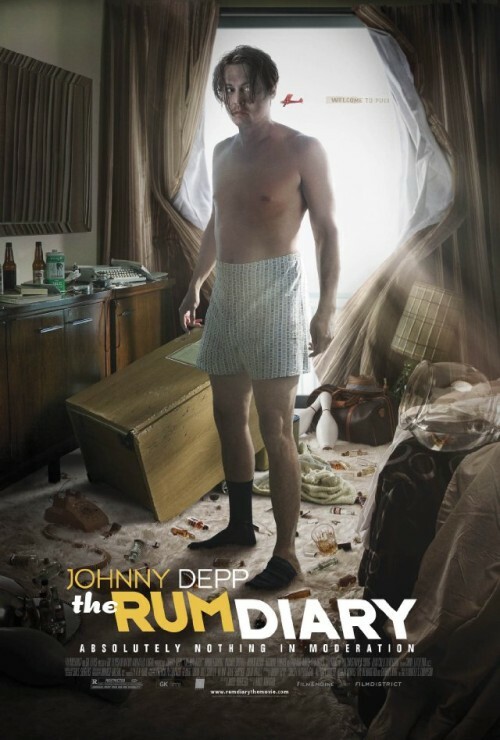 The Rum Diary: “Absolutely Nothing In Moderation” except for this movie. Hunter S. Thompson sits among my top ten favorite American writers. While I may not see eye to eye with him on every facet of his unusual view of the world, I always love his voice and can appreciate how he does view that world. The Rum Diary in the form of this motion picture is not a Hunter S. Thompson story Oh sure, his name is plastered all over the marketing. He wrote a novel of the same name. Johnny Depp, who spent tons of time with Thompson to learn his mannerisms before the writer’s suicide to prep for Fear and Loathing in Las Vegas, plays Paul Kemp, the creatively blocked journalist and presumably Thompson’s alter ego. But nowhere in director/writer Bruce Robinson’s adaptation can we hear the distinctive voice of the writer — even when Depp is talking like him. I’m going to go through a play by play to analyze why the film fails. I don’t have to. It’s boring, meandering, and never feels like it commits to anything. Maybe this is what the book reads like. I haven’t read it. Presumably Depp ran across the manuscript in Thompson’s Colorado cabin and pushed to get it published. Maybe there was a reason it wasn’t published. Maybe it was written before Thompson had found that distinctive voice. Maybe it was written about a time in Thompson’s life before he found that distinctive voice — somewhere after alcohol but before adrenal chrome. Thompson created the style of Gonzo Journalism that is about taking everything in extremes. Anything before that, by comparison, is going to be lackluster. I don’t know. That’s a lot of maybes. The end result is nothing to spend two hours with. The acting is fine, but not great. The photography is fine, but not great (surprising given that the Director of Photography was Dariusz Wolski). The locations should have been beautiful, but weren’t. Just — bleh. Placing a dedication to the late Hunter S. Thompson is an affront to Hunter S. Thompson. This is just a test comment, thrown into a post about an utterly forgettable film.